This topic was published by DevynCJohnson and viewed 1045 times since " November 15, 2015 @ 11:13UTC ". The last page revision was " November 20, 2015 @ 11:11EDT ". Sometimes, computer users may notice a weird rectangular character with numbers inside. This is a representation of a character/symbol that the system cannot display. To make the system render these characters correctly, certain fonts must be installed on the system. To know if your system is unable to produce some characters, see if any of the characters below are visible or if a rectangular symbol is seen. Alternately, you can view the links given below. If a rectangular character with numbers inside is seen, the contained numbers are the character's hex code (this is also the Unicode number). The hex code can be used to identify the character. Also, the hex code can be used to find the needed font package. The hex code starts at the top left corner of the rectangle and goes left to right and then down. Once a hex code is obtained, users can search the Internet for the needed font. For instance, go to http://www.fileformat.info/ and type the code in the search box. For example, for the symbol "⅌" (hex code: 214c) type "214c" in the search box. The user should find a page like this (http://www.fileformat.info/info/unicode/char/214c/index.htm). 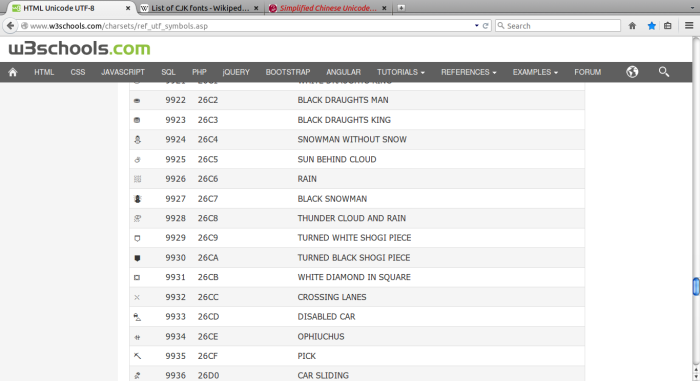 Then, click "Fonts that support U+214C" which goes to http://www.fileformat.info/info/unicode/char/214c/fontsupport.htm. 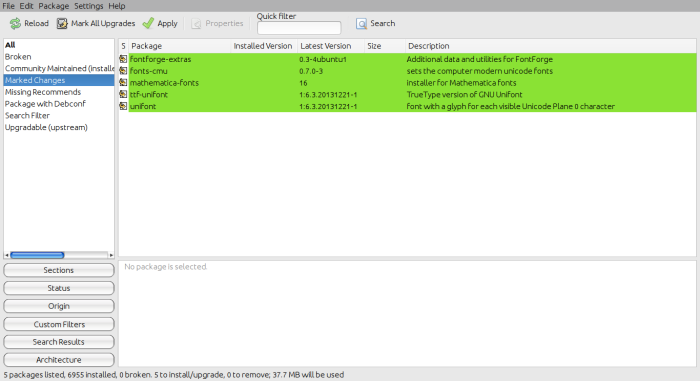 In the list, there is the font "GNU Unifont" which is supported by Linux. Next, install this font using your preferred package manager. 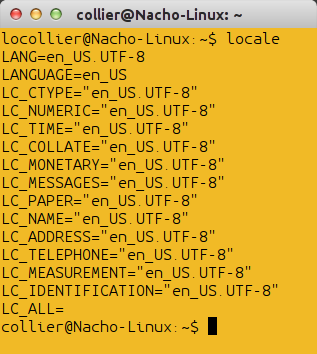 Many Linux packages that have a format like "fonts-*" or "ttf-*" are typically font packages. Installing some of these can provide the missing characters that users may try to view. 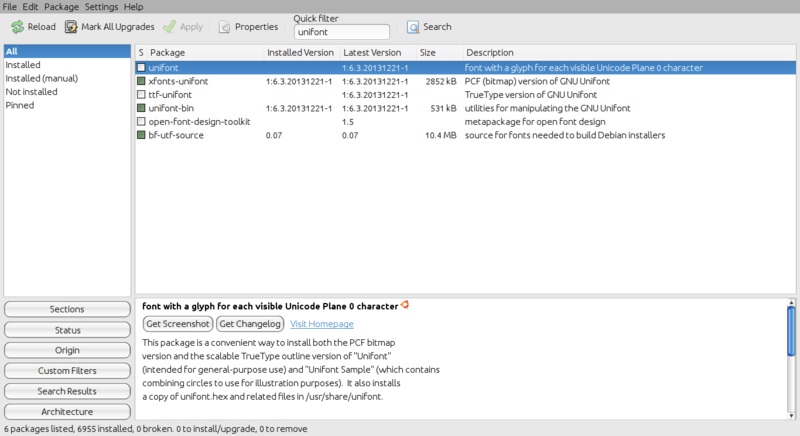 GNU Unifont (already briefly mentioned) provides characters for the Unicode 7.0 Basic Multilingual Plane (BMP). Installing this package will provide many characters that may be missing. "fonts-cmu" (Computer Modern Unicode Fonts) is a collection of fonts specifically for X11 systems. This package provides over 30 font sets. "fonts-oldstandard" provides 19th and 20th century fonts to Linux. "mathematica-fonts" provides the fonts that are used by Mathematica. 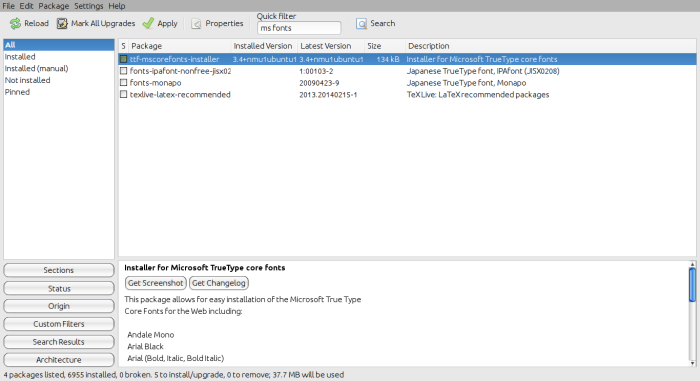 "msttcorefonts" or "ttf-mscorefonts-installer" provides the Microsoft True Type Core Fonts. This is needed by some Windows programs that may run on a Linux system. "ttf-dejavu" (also called "DejaVu fonts") provides additional serif, sans, and monspace fonts. "ttf-bitstream-vera" provides fonts for Turkish languages (ISO-8859-9), Western European languages (ISO-8859-1 and ISO-8859-15), some Eastern European languages (partial ISO-8859-2), and various mathematical symbols. Some users may wish to see a different style of fonts. At http://www.fontsquirrel.com/fonts, users can download a variety of free and legal fonts for their system. However, the website also has some fonts for sale. FontForge is an application used to create and edit fonts. 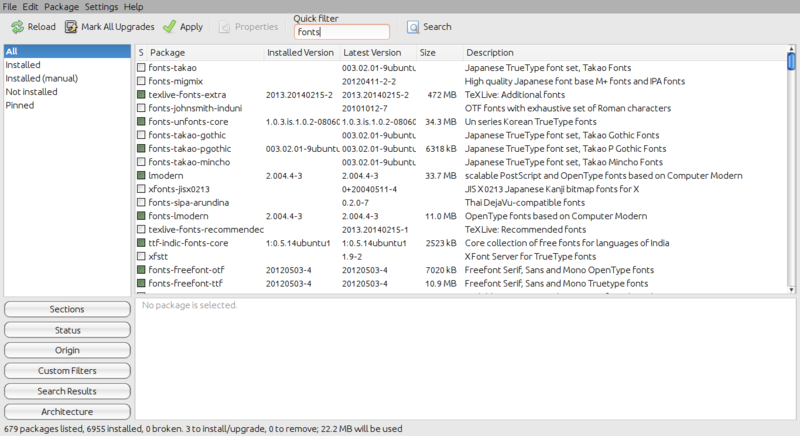 Below are some commands that can be used on Debian-based systems to install many fonts on the system. When the desired system language is not working properly, be sure that the system is set to the correct locale. If the incorrect locale is listed, try running "dpkg-reconfigure locales" with Root privileges on a Debian-based system. 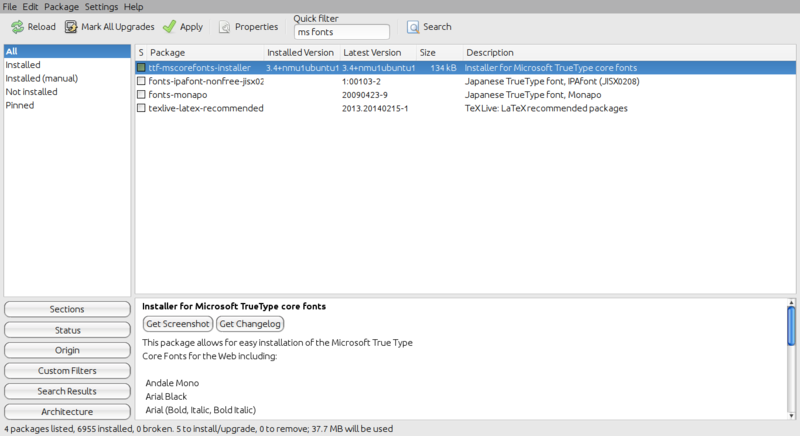 If the locale is correctly listed, be sure that the fonts for that particular language is installed. Some users may need to search the Internet for the needed font. After installing the suggested font packages, I can now see the previously missing characters.